Virginia’s Gateway Region is a publicly and privately funded economic development organization that serves eight cities and counties just south of Richmond, Virginia. Their purpose is to facilitate and attract new business investment in the area, work with existing businesses, and enhance the overall economic viability of their region. 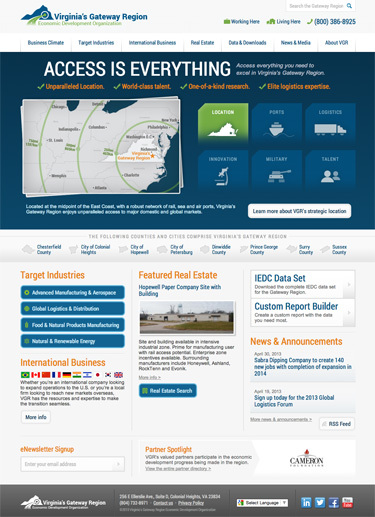 Their new website, located at http://www.gatewayregion.com, went live recently, and we are happy to announce it here. At the outset of the project, Virginia’s Gateway Region (VGR) set out to create a world-class online communication tool for the organization to attract and grow business in the region. The new website helps accomplish this goal in several ways. The theme of the website, “Access is Everything,” underscores VGR’s distinct business advantages and stakes a claim to four primary advantages. The website’s homepage clearly articulates the advantages of doing business in the region. Tabs featuring information about transportation, ports, logistics, innovation, military presence and skilled workforce stake a claim and send visitors deeper into the website to explain and demonstrate each claim. Without some context, visitors don’t know what communities are represented by VGR. We included an area on the homepage containing each county and city, and when a visitor puts their mouse over one, a box highlights location and a short description of the community. VGR is clear about companies that could succeed in their region. The homepage lists these four industries and provides links into “hubs” for those industries containing advantages, assets, training and education information, major employers, accolades and occupation/wage information. Because VGR spends time and effort recruiting internationally, there is a section on the website to support those marketing efforts. Here, companies can compare Virginia to other states, see international companies that are already located in the region, learn about support and services VGR offers and learn about foreign trade zones. Existing companies in the region can also get information about exporting their goods and services. VGR offers access to search the full database of available properties directly on their website. Prospects can access GIS maps and property data, and brokers in the region can add their listings to the full real estate database. Additionally, featured real estate allows VGR to draw awareness to available properties they want to feature and sort those by community. Each featured listing has a photo, description and VGR can upload documents about the property for download by prospects. In addition to these features, there are also “Working Here” and “Living Here” sections that allow visitors to browse the website based on their preferences. In VGGR's view, the website redesign has been an overwhelming success. “Much of [the success of the website redesign] can be attributed to foresight of both RWC and VGR, and the choice and the user-friendly construction of the content management system. We’ve seen a spike in website traffic. We’ve heard general compliments about the quality and accessibility of the new website, especially via mobile devices. We feel great about directing clients to the website because of its deeply thought-out organization, content and design. Since it accomplishes the goal of presenting a world-class professional face for the organization and region, we are happy to share it and add to it for the foreseeable future,” said Renee Chapline, Executive Director at VGR. “In a word, the redesign experience was smooth. Besides taking our ideas in the early stages, RWC took our feedback and integrated it into the project, combining expertise on both sides to create a cohesive and refined final product,” added Chapline.